"One of my stepmother's recipes...she used to fix this for Easter." Place ham in a shallow roasting pan, and stud ham with whole cloves. In a small bowl, mix orange juice concentrate with honey. Pour mixture evenly over ham. Tent ham with aluminum foil. Bake ham for 1 hour, basting occasionally. Everyone loved this. I combined the honey and orange juice and poured it over the ham and then let it cook. I didn't have any whole cloves, so I just ommitted them completely. This was pretty good but found it could have used more honey and more zip. Next time I will use this recipe but add Worchestershire sauce. I make this ham every year. Instead of honey I use 1 cup of maple syrup which gives a thicker glaze. Instead of frozen orange juice I use ready to drink orange juice. It is a hit in our family! 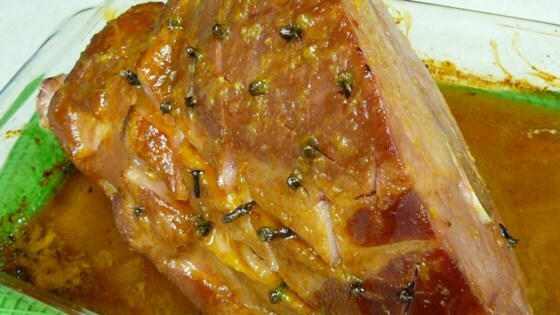 I tried this recipe yesterday for my New Year's Day ham and can sum it up in two words: Simple Elegance! Got rave reviews of this at Christmas! I had to up the recipe to feed 6. I used orange blossom honey to add even more orange flavor.